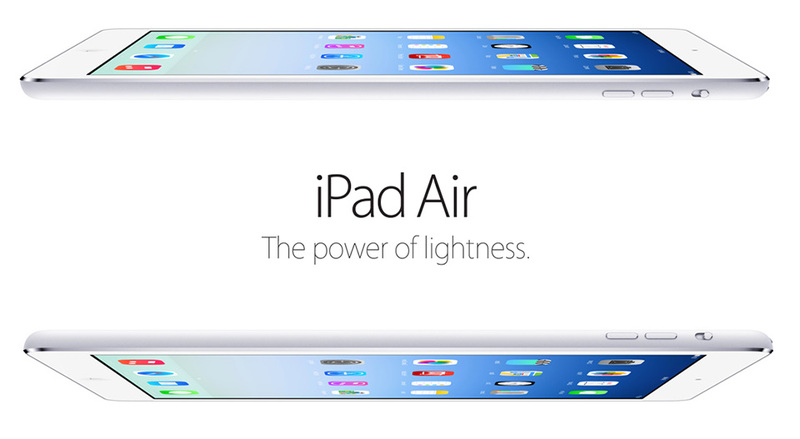 The Apple iPad Air released recently by Apple in a conference is a public pleasing device. Powered by the latest A7 chipset coupled with a M7 motion processor, it is no slouch. The name says it all, it is extremely light in weight and has a strongly built body. Engadget(A big name in tech related news): Despite its petite size and lightweight build, it doesn’t feel at all flimsy. The unibody aluminum chassis is just as solid as on older iPads. The sides have a blunter edge this time around, so you get more of a grip than the gradually sloping edges on previous models; and Apple has added chamfered, diamond-cut edges that form a boundary between the bezel and the rest of the tablet’s body, which gives it a premium look. In our experience, however, the downside to chamfered edges is that they’re often susceptible to dings and scratches. Anandtech( A reputable hardware review site): Apple’s decision to unify silicon across the iPhone 5s, iPad Air and iPad mini with Retina Display is an interesting one, but ultimately it doesn’t come with any real tradeoffs for iPad owners.Apple’s own 64-bit Cyclone cores are incredibly powerful, even more so than I originally expected when I reviewed the iPhone 5s. Apple seems to have built a bigger, higher performance CPU architecture than any other ARM player, including ARM itself. The design isn’t perfect, but it’s a completely different caliber performer than anything else it competes against. As such, Apple was completely justified in putting the A7 in both the iPhone 5s and the iPad Air. If anything, I’d argue that it might be overkill for the 5s given the device’s smaller battery, but my sensibilities soon get the best of me and remind me that more performance on tap is never a bad thing. Time: The Air sports the same screen as the old model, so it’s obvious what Apple shrunk to squeeze it into the narrower case: the borders. As with both variants of the iPad Mini, the bezels along the left- and right-hand sides of the display (when held in portrait orientation) are now slender rails. At first, that made me nervous — I worried that my palms would intrude on the screen real estate, covering vital information and possibly even triggering features which I didn’t intend to trigger. In reality, that wasn’t an issue, in part because iOS is designed to reject such accidental input. The bezel reduction also has a major side benefit. Depending on the size of your hands, it can be much easier to reach all the keys on the on-screen keyboard as you clutch the Air in portrait mode. I typed quickly and accurately with both thumbs, a little as if it were the world’s largest BlackBerry. The Hardware performance has been bumped up from the previous iPad and also from the iPhone 5s. GFX benchmark has received a 90% bump in score, 72 times better graphic performance than its predecessor meaning better performance in games. This new A7 chipset by Apple is a very good performer. iPad Air is 20% thinner and 28% lighter than the iPad 4, the bezels of the iPad air are a 43% thinner than the previous iPad. Has a 128 GB storage option, something we have been wanting since long. Super fast wifi through mimo, which basically is made possible by using 2 antennas. Refined OS via iOS 7, also the camera has been improved a lot and the megapixels have been bumped to 8. The Apple iPad Air is a solid upgrade over the iPad 4, even if you will be buying the first time you will not be sorry. With the new architecture it blows away the competition easily.